Last week, I posted a tentative schedule for my research plans. That schedule was certainly ambitious, and while I have been having a wonderful time meeting with and talking to interesting people, I am now backlogged with so much information. I have been trying to process it and analyze it all in drafts of transcriptions, but I am finding I need a bit more time to work through things with a level of thoroughness with which I feel comfortable and prepared. Therefore, I have revised the schedule to include new anticipated post-interview blog post dates and updated some TBD dates for interviews. Stay tuned, and thank you for reading! I will be interviewing Gretchen Grossman-Mobley, the author of the four-and-a-half-star rated book Ring Around the Rosary, through e-mail Saturday, March 28. I hear a lot of people say that the fear of death and the fear of public speaking are two of the main fears in my generation, but I disagree. I think it’s the fear of silence. We refuse to turn off our computers, turn off our phone, log off Facebook, and just sit in silence, because in those moments we might actually face up to who we really are. We fear silence like it’s an invisible monster, gnawing at us, ripping us open, and showing us our dissatisfaction. Silence is terrifying (Bethke). I had chosen this passage because I felt that it conveyed an issue I talk about at length in my daily life, be it at work with students or at home with friends. The tweet was fav orited and replied to twice; one reply came from @ggretchenmobley, one of my new Twitter followers. I didn’t recognize the name, so I clicked to her profile in attempt to try and learn a little bit about her. I was pleasantly surprised and intrigued when I saw the following in her bio: “Teacher ~ Mom ~ A sweetheart calls me Oma. Former Nun ~ Traveler to NYC & SF ~ RING AROUND THE ROSARY#Memoir that reads like a #Novel.” When I began my research, I assumed I would have a very easy time finding former churchgoers who no longer practice their religion and/or do not believe in God. However, everyone I had gotten in contact with up to the time Gretchen and I connected had been religious and in the process of strengthening a relationship with God. A former nun would certainly help give scope and perspective to my project. I clicked through her website immediately, looking for more information about her story and book. This quick digital journey led me to lear n that she had entered a convent in 1961 but left five years later. After leaving, she was married, had children, attended college, and became a teacher. I contacted her to see if I could interview her both through her website and via Twitter, and she replied back almost immediately. Her book, Ring around the Rosary, is a memoir that begins with her as a child, contemplating what it would mean to become a nun. 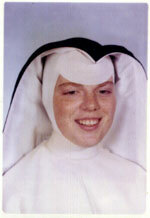 Then, as a 17 year old, she makes the decision to join the convent. Because Gretchen and I have been communicating back and forth already through e-mail, we have elected to conduct our online interview through e-mail, as well. While I am again a bit saddened by the fact that the e-mail form will produce, as Brinkmann and Kvale write in InterViews, “a reflective distance without cues from bodies and spoken language,” Gretchen is a writer, so I have no fear that her responses will contain both “rich and detailed responses” that are the lifeblood of qualitative interviewing (174-5). 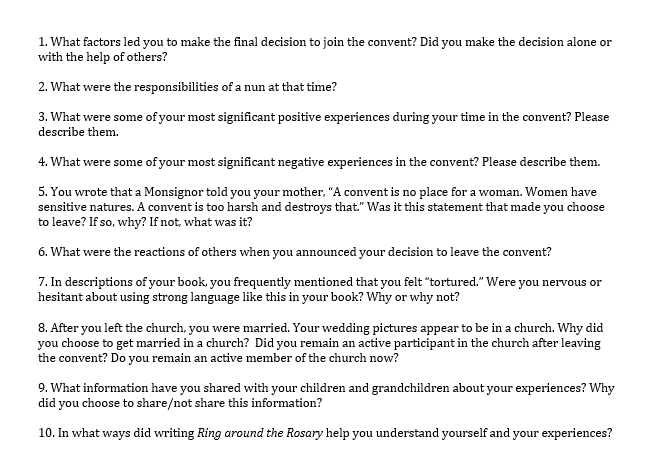 I plan on starting with ten questions, as pictured in the screenshot below. I am also in the process of reading her memoir, and it is likely that the text itself will answer many questions a raise others. I am hoping that I will have the opportunity to send additional, follow-up questions via e-mail at that time. Images courtesy of Gretchen Grossman-Mobley.